Parish Records - What are they? In 1538 Thomas Cromwell the Vicar General to King Henry VIII declared that all marriages, christenings and burials should be recorded; normally these are kept at the Parish Church. In 1598 an Act was passed that meant these records should be copied and sent to the bishop. These copies are known as the Bishop's Transcripts. 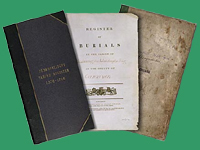 This is a series of books published in the late 19th and early 20th centuries, and hold transcriptions of marriage registers. Learn more about W.P. Phillimore by clicking here or by following the link above. Trace your family roots back through baptisms, marriages, and burials. Most parish records go back to the 1500s, so these are a valuable resource for your research. On baptism records, you may only find the name and date of baptism - the father's name was recorded, but it is unusual for the mother's name to be recorded, unless the child is illegitimate. Marriage records contain the name of the bride and groom, the Parish where they were married and sometimes details of the brides parish. More details was added to the records in later years. On burial records, you should be able to find the name and father's name. The age was also noted in later records. View a list of Parish Records avalable on CD on our website by clicking here. You can also view the Parish Records online at TheGenealogist.